A lot of you guys have asked about some 15mm and 19mm rods as an accessory to the Multi Facet to give you some extra options for mounting your monitors, follow focus units etc. These may also be useful for mounting motors or anything else using the 15mm or 19mm size that is common to most all cameras. These kits include one 2in, one 3in, one 4in, and a 15mm or 19mm rod. 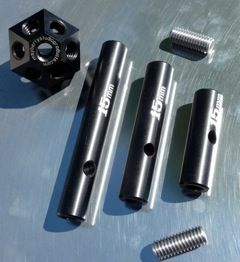 These rods are made from T6061 Aluminum and precision ground to exact tolerances to insure proper fit. They are also threaded on each end with 3/8-16 holes so they can be attached together or bolted on to other items or rigs. There is also a 1/4 inch hole in the center of the rod for loosening and tightening the rods to each other or into the Multi -Facet or whatever you can dream up. To see more images just go to the Gallery.